Vidya at Filmfare Awards Marathi 2015 in a Gaurang Paithani sari. 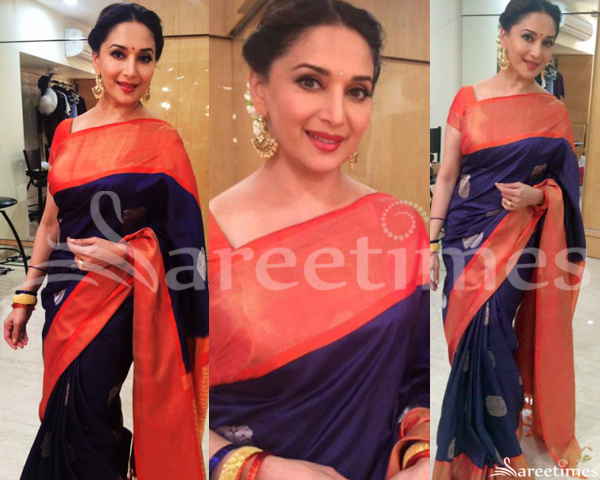 Madhuri Dixit was spotted at a navratri celebration event in a blue and orange silk saree paired with an orange color short sleeves blouse, designed by Gaurang Shah. 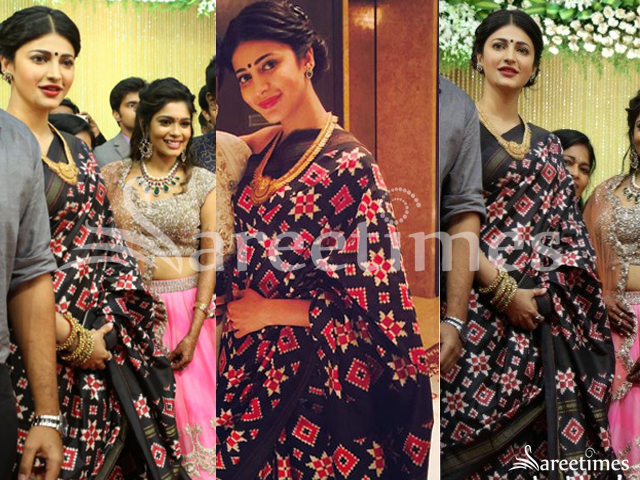 Shruti Haasan at Shanthnu and Keerthi’s wedding reception in a black Gaurang Shah patan patola saree. Vidya Balan in Gaurang Shah kanjeevaram chanderi saree. Peach and purple combination with bird motifs paired with matching elbow length sleeves boat neck blouse. Kajal Agarwal at Malabar Gold store inauguration in a silver color Gaurang Shah kanjeevaram saree featuring yellow border paired with silver sleeveless blouse. 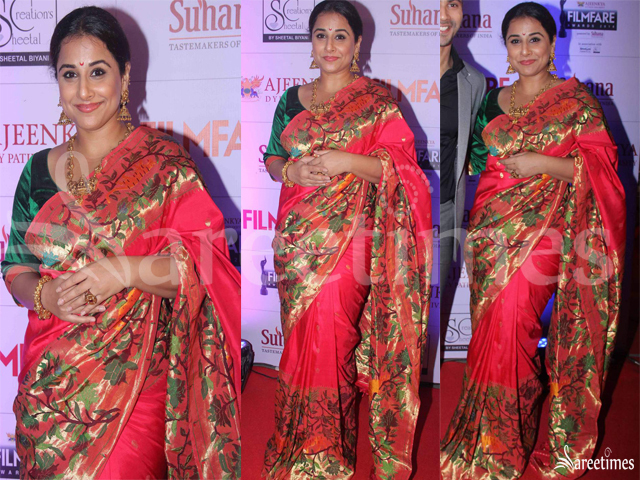 Vidya Balan at asiaSpa Awards 2015 in Gaurang Shah Kanjeevaram saree. Silk saree paired with pure gold zari broder and purple zari rich pallu with 3/4 th sleeves round neck blouse. Shruti Hassan at "Uttama Villain" audio launch event in Gaurang Shah pink light weight traditional saree featuring silver zari borders and zari bhutis all over paired with gold elbow length sleeves blouse. 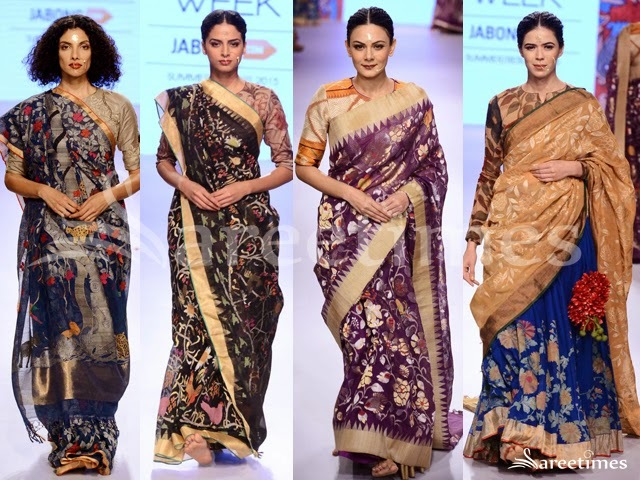 Models displaying designer sarees by Gaurang Shah at Lakme Fashion Week 2015. 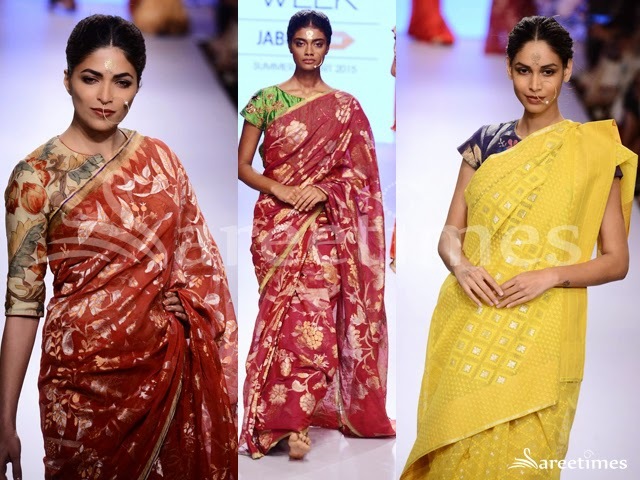 Fashion models in designer sarees by Gaurang Shah at Lakme Fashion Week 2015. 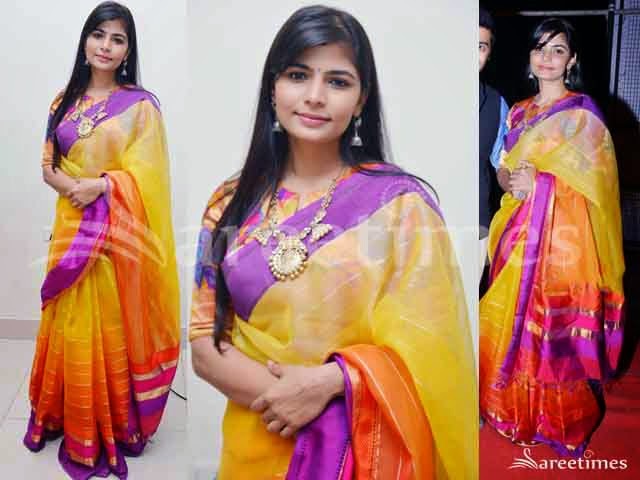 Singer Chinmayi at "Tiger" movie audio launch event in Gaurang Shah saree.Yellow color kota silk saree featuring purple border paired with boat neck elbow length sleeves with printed satin blouse. Bollywood and South Indian actress Taapsee walked for designer Gaurang Shah at Lakme Fashion Week Winter/Festive 2014. She looked beautiful in green and orange traditional saree. Gold embellished brocade work through out border. Paired with designer embellished full sleeves saree blouse. Models walked for designer Gaurang Shah at Lakme Fashion Week Winter/Festive 2014. Bollywood actress Vidya Balan attended the Dahi Handi ceremonies yesterday on the auspicious eve of 'Janmashtmi'. The actress looked beautiful in a hand painted kamalkari saree by designer Gaurang Shah. Its a beautiful beautiful saree. And I like how she popped the look with a hot pink blouse to match the inside lining on the border of the saree. Bollywood celebrity Kirron Kher in beautiful peach designer embroidery silk saree. Designed by Gaurang Shah at Day 3 LFW Summer/Resort 2014. Embroidered buttes all over lehenga and silk border. Printed stripes through out border. Paired with designer quarter sleeves silk saree blouse for back. Model displaying beautiful peach designer silk saree. Designed by Gaurang Shah at Day 3 LFW Summer/Resort 2014. Printed designs work all over saree and silk border. Zari work through out border,running pallu. Paired with green designer embroidered quarter sleeves saree blouse for back. Model displaying beautiful yellow designer embroidery net saree. Designed by Gaurang Shah at Day 3 LFW Summer/Resort 2014. 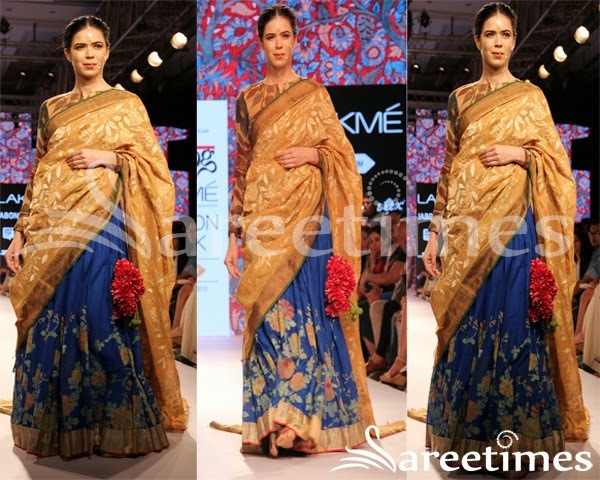 Embroidered sequins buttes all over saree and printed stripes through out border. It is a silk border. Paired with designer quarter sleeves saree blouse. Model walks in beautiful pink designer printed saree. Designed by Gaurang Shah at Day 3 LFW Summer/Resort 2014. Printed designs all over saree and magenta unique border. Cream and magenta stripes through out border. Paired with designer embroidered quarter sleeves saree blouse. Model walks in beautiful yellow designer embroidery lehenga. Designed by Gaurang Shah at Day 3 LFW Summer/Resort 2014. Embellished patch work all over lehenga and gold embellished border. It is a green embroidered dupatta with peach embroidered border. Mirrors all over dupatta. Paired with orange designer embroidered quarter sleeves saree blouse. Model walks in beautiful green designer embroidery lehenga with patch work border. Designed by Gaurang Shah at Day 3 LFW Summer/Resort 2014. It is a yellow silk dupatta with peach border. Applique patch work through out border. Paired with designer embroidered quarter sleeves saree blouse.